While nearly zero energy projects in Europe focus on reducing heat demand, green buildings in tropical Singapore require lower cooling loads. To study and discuss methods to meet cooling needs, construction and energy experts from all around the world met in Singapore in late October for a two-day workshop organised by the Building & Construction Authority Singapore (BCA) and the IEA’s Buildings and Communities Programme (EBC). The aim of the Future Buildings Forum (FBF) 2017 was an agreement on strategic R&D priorities for Transforming Cities in Hot and Humid Climates Towards More Efficient and Sustainable Energy Use. The FBF Think Tank Workshop 2017 brought together around 60 invited experts from seven of the IEA’s Technology Collaboration Programmes (TCP), for example, Solar Heating and Cooling (SHC), District Heating and Cooling (DHC), and Photovoltaic Power Systems (PVPS). Findings will be available in the first quarter of 2018. “During the workshop, we concentrated on the issue of efficient and renewable space cooling in hot and humid climates, and this will also be the focus of the results report,” said Andreas Eckmanns, Chair of the IEA EBC programme. Previous Think Tank Meeting reports from 1990, 1995, 2001, 2007 and 2013 are available for download. Important input came from the BCA, an agency managed by Singapore’s Ministry of National Development. 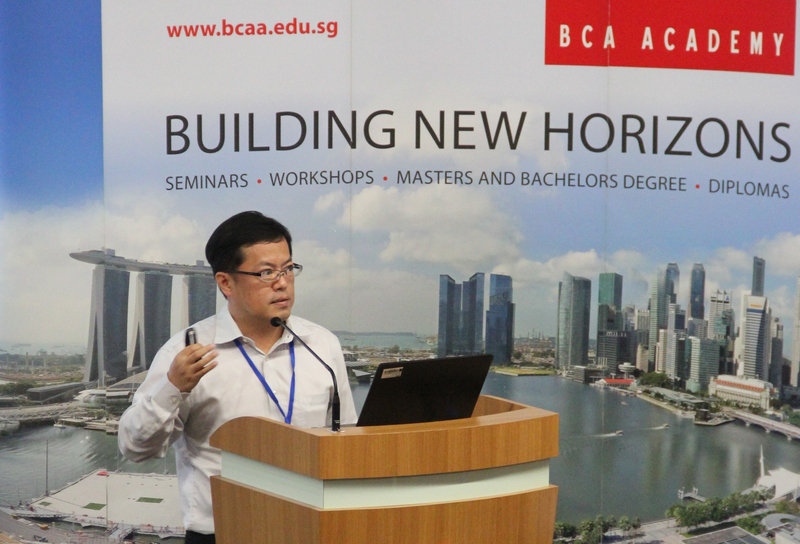 Dr Gao Chun Ping, Director of the Green Building Research Department at the BCA´s Built Environment Research and Innovation Institute, presented milestones in green building from across the city (see photo above). Since the launch of the BCA Green Mark scheme in 2005, Singapore has experienced exponential growth in green building construction. The number of structures went from 17 in 2005 to more than 3,100 in 2017, which translates into about 92 million m2 of gross floor area, 34 % of the total around the country. The Green Building Movement said that 80 % of the building stock would be ‘green’ by 2030. 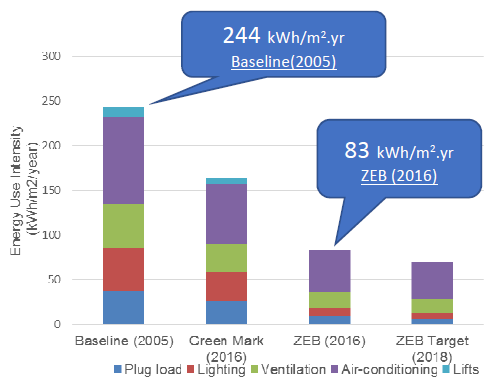 2005’s average baseline consumption in commercial buildings was 244 kWh/m2a, of which more than half was used for air-conditioning and ventilation (see the figure above). The current Green Mark scheme has lowered specific energy demand to 160 kWh/m2a, but the BCA has been setting up pilot projects that show even greater efficiency. One example is the BCA Academy’s Zero Energy Building, whose annual energy demand of 83 kWh/m2 will be met by an on-site solar photovoltaic system. Since there is limited roof space on high-rise buildings, district cooling solutions are becoming ever more important. For new developments, construction companies have begun to look for ways to connect newbuilds to district cooling systems. Today, the BCA Green Mark is also used for supermarkets, restaurants, healthcare facilities and supporting infrastructures, data centres, rapid transit systems, and even parks. The 2,600 m2 collector field which is currently being set up on the roof of Swedish furniture company IKEA shows that solar thermal cooling can play a lead role in meeting the BCA’s ambitious green building targets in Singapore. The solar heat will be used to run an 875 kW (250-tonne) absorption cooling machine and the system is said to start operating by the end of 2017.